The Castle EUR-MINIP has a robust small compact outer case making it perfect for residential installations. 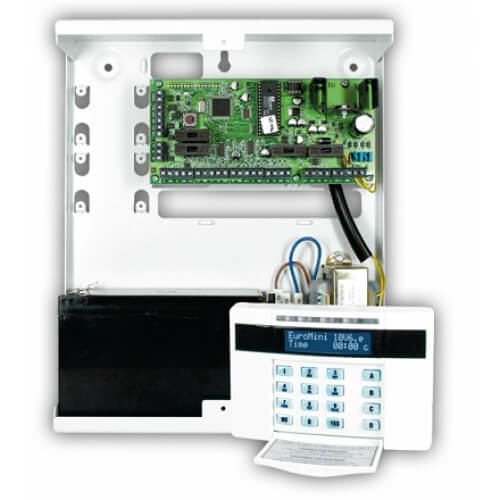 Up to ten wired detectors can be installed straight to the intruder alarm endstation PCB using (EOL) End of Line configuration, also this versatile security product makes it simple to upgrade older burglar alarms with the double pole configuration allowing up to nine detectors to be installed to this piece of security equipment. This Grade 2 burglar alarm is suitable for installations where you might be at risk of burglary by a more experienced thief who may be able to overcome a basic intruder alarm system. A Grade 2 burglar alarm system can communicate to a central station, while a Grade 2x intruder alarm are non-communicating or maybe called"bells only". The Castle EUR-MINIP intruder alarm panel with proximity keypad has been designed to meet EN50131-3 requirements and is perfect for use in security systems that need to be designed to comply with EN50131 at Grade 2x. All of the many features of the Castle Euro mini are present, as well as the additional flexibility of using proximity tags or cards to control your burglar alarm system.